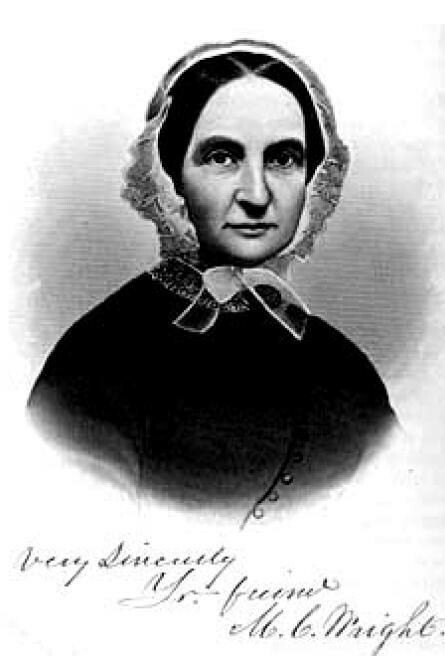 Martha Coffin Wright was the youngest daughter of Anna Folger and Thomas Coffin. She was brought up as a Quaker, but upon her marriage to Peter Pelham, a non-Quaker, she was expelled from her Quaker meeting. He died when she was 19, and she moved to upstate New York to teach at a Quaker School for girls in order to support herself and her infant child. She then met and later married a young law student, David Wright, with whom she had six more children. Martha and her sister Lucretia attended the founding meeting of the American Anti-Slavery Society in Philadelphia. She became very active in the anit-slavery movement, making her home in Auburn a station on the Underground Railroad. In 1848 she introduced her older sister, Lucretia Coffin Mott, to Elizabeth Cady Stanton which was the start of the Women's Rights Movement. After the Civil War she work in forming the American Equal Rights Association, an attempt to merge the issues of black suffrage and woman suffrage. She was the mother of Eliza Wright Osborne, another Women's Rights Activist and philanthropist, and the Grandmother of Thomas Mott Osborne, the famous prison reformer. 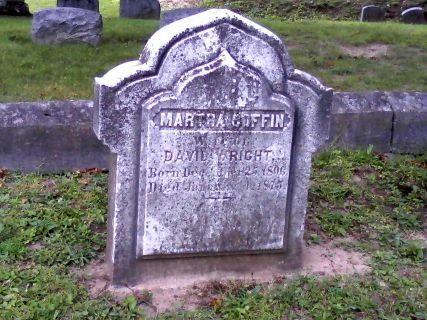 Martha's is buried in the Osborne plot in the Morningside section of Fort Hill Cemetery.